Hilton HHonors has launched a new offer for stays at select hotels in New York that are both booked and consumed between June 1 – March 31, 2017. Members that book minimum two night stay (exceptions) are eligible for $100 Amex Gift Card and those that book minimum 60 days in advance also get $25 Uber credit. Note that the minimum stay is two nights except at Hilton Garden Inn Manhattan/Chelsea and Hampton Inn Manhattan/United Nations where it is four nights. You must use this specific web page to bring up the NYC Offer rates. 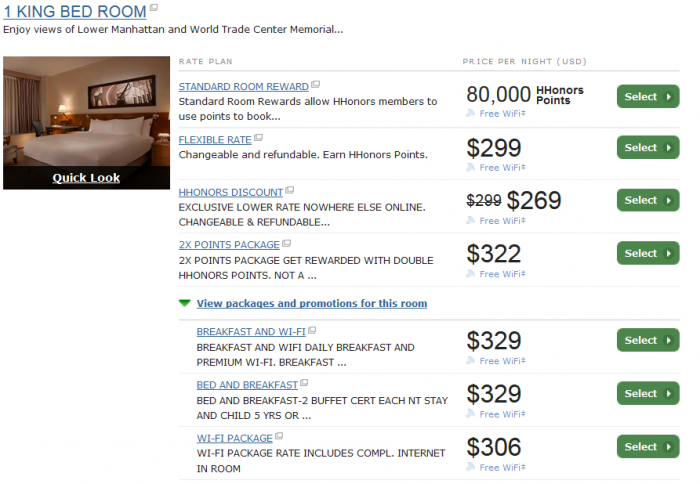 Seems that this NYC Offer rate is the Best Flexible Rate + $10 that is not bad considering the $100 gift card offered. Also, this has the same cancellation (one day before) and prepayment (none) requirements. This rate makes sense when there are no discounted rates available or when you are expensing the stays (and keeping the gifts for yourself). Subject to availability at participating hotels within the Hilton Portfolio throughout New York City for stays booked and completed between July 1, 2016 and March 31, 2017. A two (2) night minimum length of stay is required at Millenium Hilton, New York Hilton Midtown, Waldorf Astoria New York, The Towers of the Waldorf Astoria New York, Conrad New York and Hampton Inn Manhattan/Times Square Central and a four (4) night minimum length of stay is required at Hilton Garden Inn New York Manhattan – Chelsea and Hampton Inn Manhattan/United Nations. Full payment is due upon arrival. Rates are valid for single/double occupancy and are exclusive of all taxes, incidental charges, and gratuities. Blackout dates, early departure fees, and deposit and cancellation restrictions may apply and vary by hotel. Unless otherwise noted, all offer components are non-transferrable or redeemable for cash, expire at check-out and may not be used or applied on future stays. To book by phone within the U.S. or Canada, please call +1-800 HILTONS (445-8667) or view Global Reservation phone numbers, and request the “Explore NYC” package or Plan Code “PGNY01” or “NY0”. Offer provides one (1) American Express gift card in the amount of $100 US Dollars per room, per stay, provided at time of guest check-in. Consecutive stays are ineligible for additional gifts. American Express gift cards may be transferable and may be used after hotel check out. For guests booking stays more than 60 calendar days prior to arrival, an additional single ride Uber credit of up to $25 US Dollars will also be awarded. Redemption of Uber ride credit requires download and signup of the Uber app. First time users of Uber may be eligible for an additional $20 Uber Ride Credit, exclusive to first time users by signing up via Hilton HHonors link. Uber sign up and usage does require a mobile smart phone and valid credit card. Gift cards/credits may be subject to additional usage rules and restrictions as noted by issuing bank or partner. If lost or stolen, hotel is under no obligation to replace gift card provided to guest. Hilton Worldwide is not responsible for services offered by participating partners or for any errors, refunds or cancellations with respect to participating partner’s events or services. No credits or refunds are permitted for unused benefits. Hilton HHonors membership, earning of Points & Miles when booking direct and redemption of points are subject to HHonors Terms and Conditions. Previous articleSPG Member Exclusive: Free Night Certificates Have Now Been Credited – Check Your Account!